Patched tunics, torn pants, questionable footwear, sunken shakos and plumes missing. Is it just me who would like to see more ragged Napoleonic miniature sculpts? While for example "campaign uniform" sets like the excellent French in greatcoats from warlord games can be altered with scalpel and green stuff its too time consuming in large numbers. Would anyone else like to see more releases in both metal and plastic with a more ragged appearance? I find the whole idea of wearing an overcoat for "tenue de route" fascinating, and I bet a lot more was done in that outfit than we realize. I remember once being told at the uniform factory that the West Point cadet's long covercoat (which is pretty much a modernized version of the grey overcoats worn in 1812-14, themselves straightforward copies of the British pattern) was worn in the nineteenth century for a surprisingly wide range of activities, including PT. I suspect the good uniforms stayed in the backpacks, and they probably didn't wear much more than a shirt and vest under the overcoat, except in the hottest climates. But it wouldn't surprise me if they marched and fought that way much of the time. I like the idea of more ragged soldiers for all the armies. I think a lot of gamers like the colorful uniforms on the figures as they do look very nice on the table. I would like lots of weathered figs. 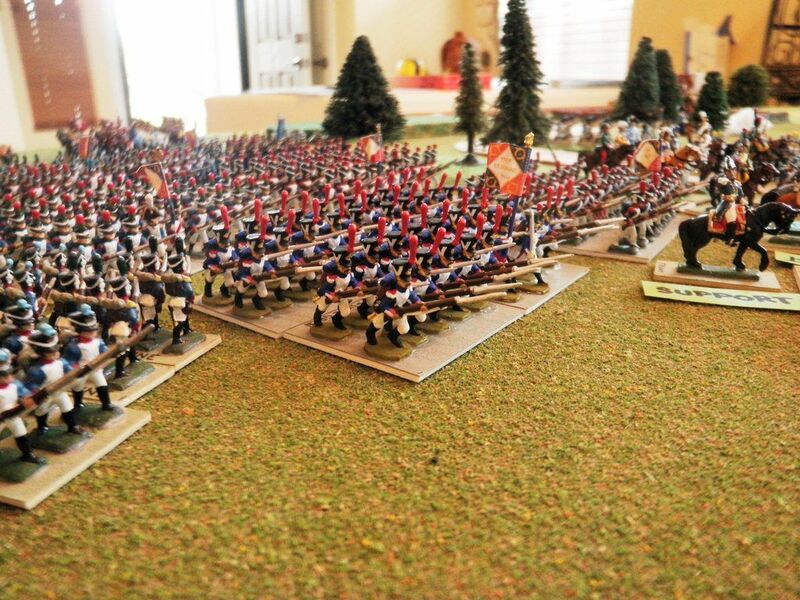 I prefer parade ground full dress for my Napoleonic figures. I enjoy the splendor of it all. Agree with @whill4. 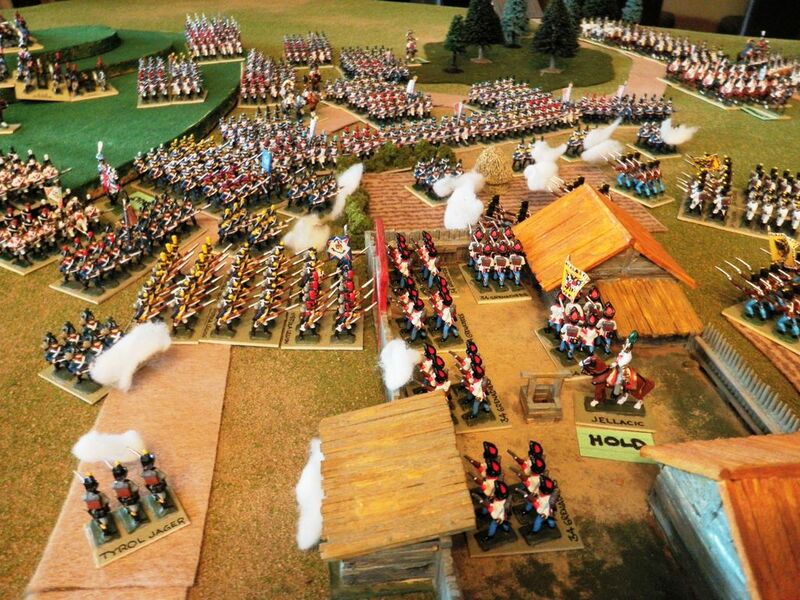 If we're gaming Napoleonics, let's do it in full dress. Even if that isn't the most likely way they actually fought. Some interesting notes on the subject that describe the hardship both the men faced and the difficulty of logistics which surely were not only the case in the Peninsular War. Also on other fronts soldiers are described in ragged conditions. The poor quality of many uniforms of the time would quickly wear out once out of the barracks and on campaign. "In September, Moore was ordered to take 20,000 men and advance into Spain "to cooperate with Spanish armies in the expulsion of the French from that Kingdom." To assist in that effort, some 15,000 reinforcements under General David Baird were already at sea en route to Corunna in the northwestern corner of Spain. Once on Spanish soil, Baird was directed to rendezvous with Moore in the vicinity of Valladolid. The combined force would then make a concerted effort to render aid to Spanish allies. Moore obeyed the directives with alacrity, but soon bogged down in a logistical nightmare of epic proportions. The army lacked the necessary vehicles for the transportation of its light baggage, military stores, and other equipment and supplies. The march was chaotic from the very beginning. Heavily loaded commissary and baggage wagons lumbered along, pulled up tortuous mountain tracks by oxen and mules already near exhaustion. The animals soon started to falter and die. Some perished naturally, while others were spared a lingering death by a merciful bullet. The men were not in much better shape. Rifleman Benjamin Harris of the 95th Rifles later recalled that in the beginning of the retreat they marched for four days and nights without a moment's rest. Such an ordeal was bound to have an effect on even the toughest old soldier, and many of the newer recruits began to stagger and fall. Sometimes they rose again, sometimes they did not, but usually no one came to their aid. The agonizing trek continued with scarcely a pause. Moore's army had seen little fighting, but had marched hundreds of miles even before the retreat was ordered. Uniforms and equipment, already showing wear and tear, began to disintegrate under the ever-worsening conditions. Felt shakos were so weather-beaten that they assumed strange, lopsided shapes, and once-immaculate red or green tunics became torn and filthy. When the British did manage to sleep in a Spanish peasant hovel, they arose the next morning to find their uniforms swarming with vermin. Above all, the men's shoes wore out, forcing many of them to trudge barefoot through viscous muck or frost-tinged trails. Harris was soon barefoot, and the constant marching pushed his sturdy constitution to its limits. "My feet were sore and bleeding," he later remembered, "and the sinews of my legs ached as if they would burst." Heavy rain, snow, and sleet alternated, soaking every soldier to the skin. What food the redcoats had in their haversacks was quickly consumed, and a gnawing hunger added to their growing miseries." "The Spanish armies were under-equipped with both cavalry and artillery. The British helped with the latter, supplying cannons for the Spanish forces. In the beginning, many of the soldiers were poorly trained and led, although the direct experience of warfare helped to counter that. There was one aspect on which the Spanish regulars could not be criticized, and that was their courage. Robert Blakeney wrote that "Courage was never wanting in Spanish soldiers," even though they were often "barefoot, ragged and half-starved."" "The regular army had a bad reputation in Britain at that time and Coss makes clear how bad conditions were for the common soldier. Exhausted from continuous marches, short on food and supplies, with wages always delayed by the government, the British soldier was compelled to survive by plundering the local populations of Portugal and Spain. Coss believes that the common British soldiers, underfed, sometimes barefoot, neglected by their country, could only survive by supporting each other. " "I suspect the good uniforms stayed in the backpacks, and they probably didn't wear much more than a shirt and vest under the overcoat, except in the hottest climates. But it wouldn't surprise me if they marched and fought that way much of the time." Depending on the timeframe and logistics, if stretched out too far away they woud likely wear a mixture of whatever remained, or could be taken from enemy casualties/prisoners and civilians. Depending on how far away they were from steady supply lines, or the varying ability to supply them. Any unit spending some time in the field who march and sleep in the same uniforms of poor quality more often than not, would likely have quite a ragged appearance. I'm another in the "splendor" camp. Full dress uniforms when possible, it's a big part of the appeal of Napoleonics for me. The warn out uniform was probably the normal giving most countries had at best yearly replacement. I am not disagreeing, however in case it is overdone – it looks – in my opinion too pathetic in miniatures, I like campaign dress – although I am not a great coat fan. and with Colours flying – even if furled in real life so the ensign didn't get blown over! and every French unit gets an Eagle, no matter how small the numbers or the Lightest of Cavalry. Realism is gents covered in mud from head to toe on 18th June. Not a shabraque in sight, oilskin covers over those shiny helmets, hussars that lack a pelisse etc. 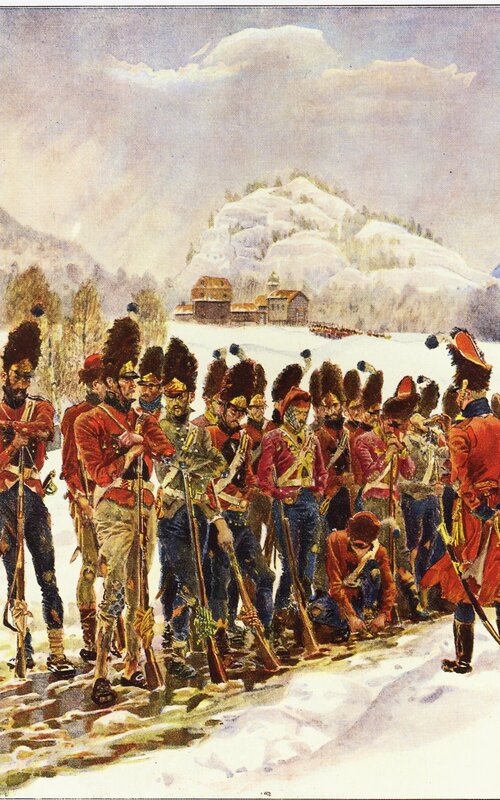 The late, great Nick Scollins painted excellent pictures of Napoleonic soldiers. IMO, he portrayed the soldier on campaign better than any other. I'll post a few pictures tomorrow and I'll also post an eyewitness account by George Barlow of the 52nd, pertaining to the state of his company at the beginning of 1812. I suspect those grey overcoats weren't as warm as their modern counterparts, but their simplicity meant they wore better and were easier to patch, and of course, you didn't have to change into them to sleep- since the overcoat was bed and blanket. Clothes were shoddier then, too- particularly for enlisted men. Reading how quickly they went through boots gives you a real appreciation for machine stitching, Vibram soles, and a procurement organization that sets and enforces standards. All of that had to have an effect on the way they looked in the field- to say nothing of their health. A good mixture of both is fine with me. At least having a choice is nice but each to their own as I can see the draw for both. For me, I prefer my 15mm Napoleonic soldiers in parade dress. But at the 15mm scale, I doubt it makes much difference. Here's the George Barlow quote I said I would post. It's from Gareth Glover's latest edited book 'A LIGHT INFANTRYMAN WITH WELLINGTON' which is a collection of letters written by Barlow.
" I regret however continuance in these quarters for the sake of the men. They are literally in rags for want of new clothing, which the paucity of bullocks and the still more wretched nature of the roads, added to our current distance from Lisbon of 280 miles, prevent from reaching our division. It has actually been some weeks on the route & in the meanwhile some of our company cannot come to parade on account of nakedness." In that statement, it shows the state the troops uniform (or lack of) was and the problems of supply in just that one snapshot. I have to say that Ive tried all styles, in 3 different scales, and the 'patched' and ragged batallions always attract more interest from onlookers. That said, perhaps 20mm or smaller are more identifiable wearing their Number Ones, while scruffiness is more appealing at 28mm plus, because it's more visible. My 2 bob's worth..
Dibble's pictures are superb but do make the point that "ragged" miniature figures of our era are simply far too clean and well turned out. The Perry figures above might have a few patches here and there, but they are almost spotless. Mud is bad enough but what ruins the smart look is days of sitting around smoky fires, UV light and then rain onto dyes far from colour fast. Its true that smaller scales has its limits. And of course personal preference. For 15mm, the parade look is more convenient. But with 28mm, worn-out details can be obtained. And I think deadhead raises a good point in that the ragged Perry sculpt look too artificially "ragged" like trendy modern jeans with holes. Besides a few patches the rest of the uniform look very neat. And the paint job is far too clean for troops on the campaign. Some paint the weathering effect too artificially with a few elegant spots on a few areas. The excellent pictures provided by dibbles provides good examples of how filthy they could be painted. Some may argue it can be "overdone", but I am of the opposite opinion that every button, plume and lacing being in its finest order looks too artificial to my taste. As pictures and sources have proven, they were for the most part in a filthy and tattered state. @Glencairn: That has been my experience too. I think its a common assumption among gamers that shining colors will attract more attention and look better for photos. People outside the hobby love the ragged effect because "it looks real". And they are viewed not just as shiny toys anymore. Same thing happens when you add casualties.